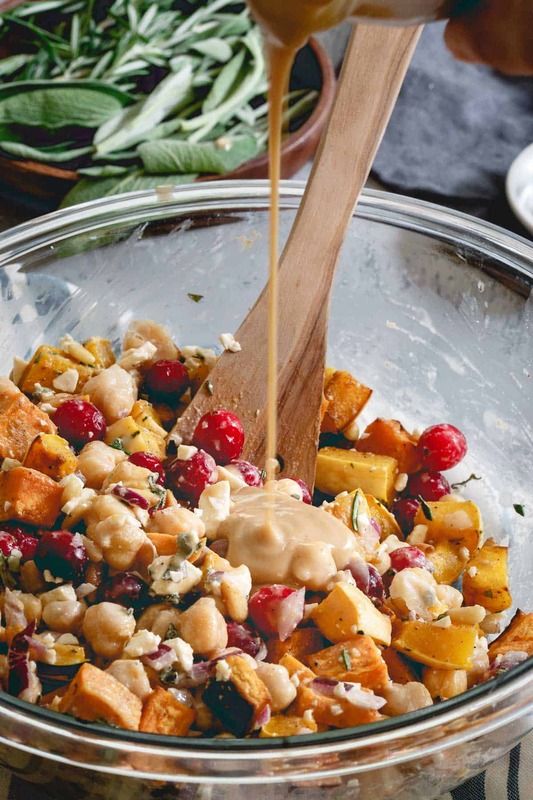 This chickpea fall salad is a hearty vegetarian meal with roasted sweet potatoes, delicata squash, cranberries, feta and a maple tahini dressing. 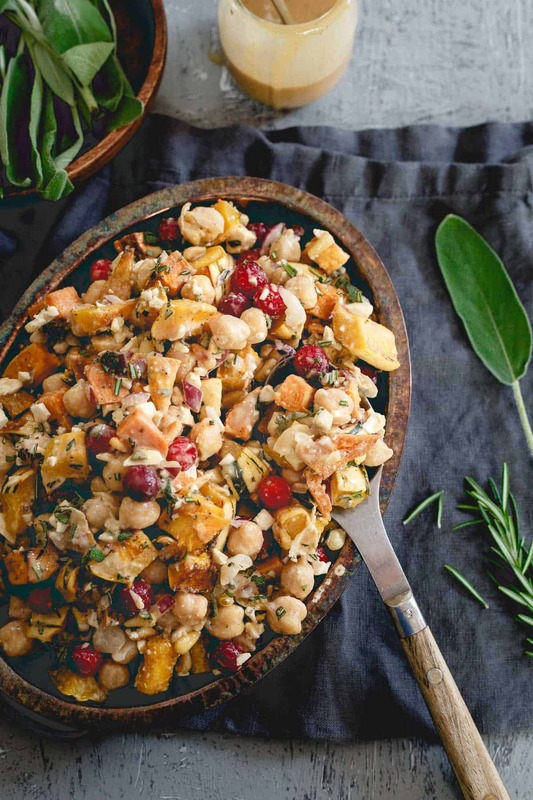 If I could combine all my ideal fall components into one dish, I think this chickpea fall salad might be it. If not, it’s damn close. *This chickpea fall salad recipe is sponsored by USA Pulses & Pulse Canada, a 2017 partner of Running to the Kitchen. Honestly, pumpkin is not even in my top 10 when it comes to fall ingredients. Give me almost any other squash (just not acorn, yuck), cranberries, herbs like rosemary and sage, apples, brussels sprouts…the list goes on and on, before pumpkin. It’s cute on my doorstep (until the savage squirrels in our yard peck it to death) and that’s where it can stay as far as I’m concerned. My kitchen is a pumpkin free zone, save the occasional can of Libby’s for a baked good or two (like pumpkin banana chocolate chip bread or pumpkin chocolate chip bars). I got suckered into buying a squash knife from the Cutco rep whom I was dumb enough to let come sharpen my knives for “free” in my home a few years back. In fact, she just left me a voicemail last night but I’m now smarter and screen that yearly call so I never feel the need to spend $125 on a tool designed solely for cutting hard, round vegetables with seeds. In order to make myself feel justified for that dumb purchase years ago, the second I see winter squash in the market, I start buying it. I get home, whip out my trusty “squash knife” and take great satisfaction in that one cut down the center (which, I will say is significantly easier than using a different knife, just not $125 more easy). I then throw it in the sink, wash it, dry it and put it away until next time while I grab my chef’s knife for the rest of the meal prep. I’m rolling my eyes at the ridiculousness of all that in case you can’t tell. The delicata squash in this chickpea fall salad was this year’s first squash acquisition. My trusty squash knife came out and actually got double use this time because I went crazy and used it for the sweet potato too. Woohoo! 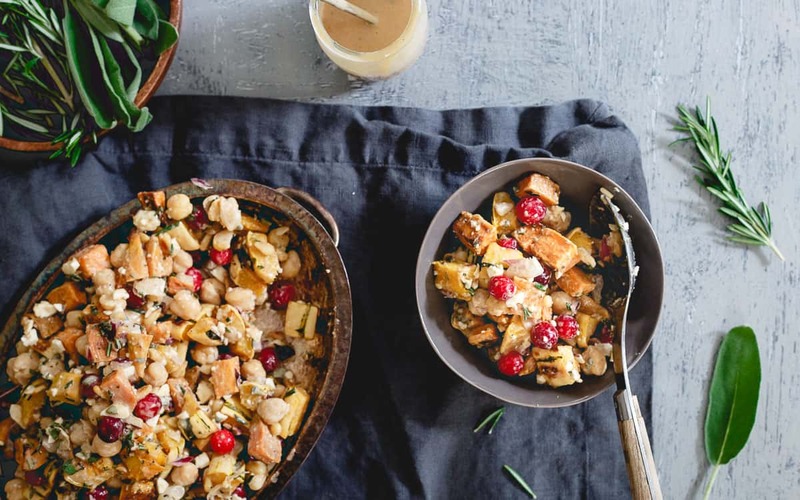 The combination of hearty roasted potatoes and squash with the burst of tartness from the cranberries, the salty bite of feta and the fresh herbs combined with a sweet maple tahini dressing all bulked up with a healthy, plant-based protein from the chickpeas – it was really hard to want for anything else. At least until a rare steak looks my way. A serving of this hearty chickpea fall salad also fits right in with the Half-Cup Habit challenge – a 4-week challenge to eat ½ cup of pulses (chickpeas, lentils, dry peas and beans) three times per week. Pulses are super easy to cook and packed with protein, fiber and essential nutrients, making them a great healthy addition to your diet! They bulk up this salad perfectly making it either a lovely fall inspired vegetarian meal or an equally delicious side dish to meat, like a nice juicy pork chop. So much for that vegetarian life. 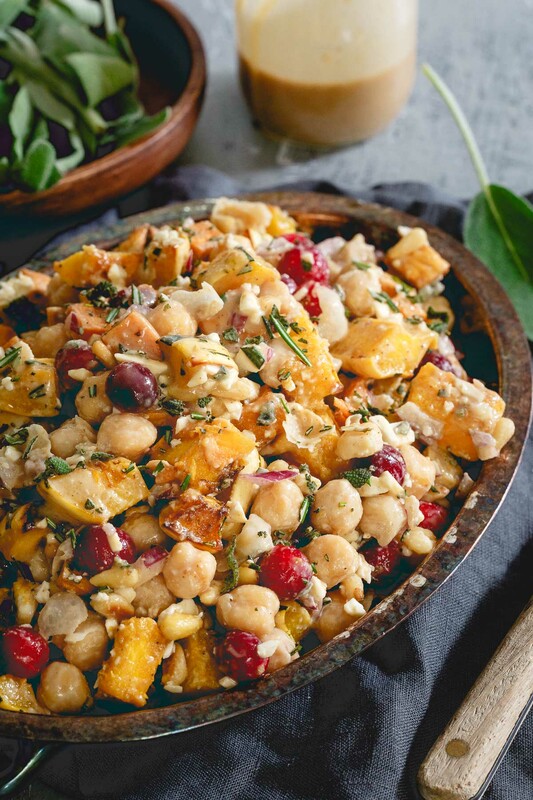 Love this chickpea fall salad recipe? Check out these other pulse-inspired dishes great for fall: butternut white bean gnocchi, cherry lentil turkey sausage stuffed sweet potatoes and avocado lentil cranberry salad. 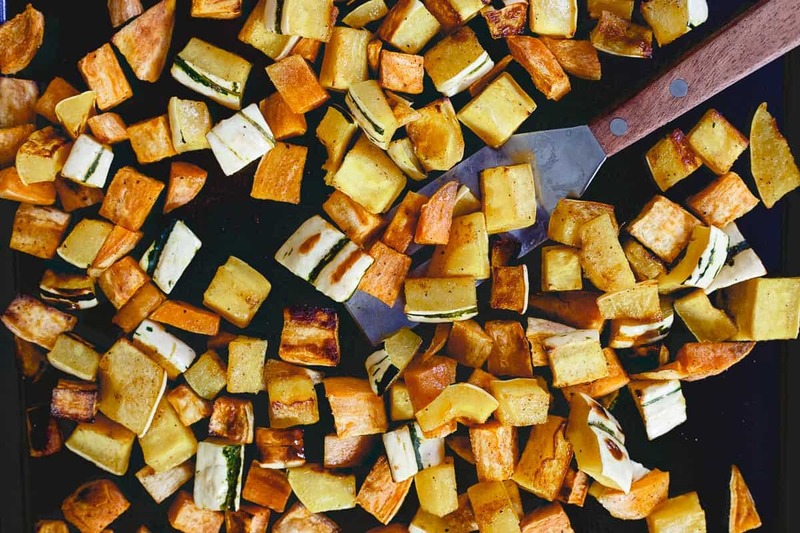 Toss sweet potato and squash with the olive oil, cumin, coriander, salt and pepper and spread out on a baking sheet. Roast for about 15 minutes, tossing halfway through. When squash is finished roasting, add to the bowl and toss to combine. Whisk together all ingredients in a small bowl until smooth. Pour into bowl with the salad ingredients and toss until evenly coated. I have been OBSESSED with tahini lately! This salad is calling my name for lunch this week! I bleed tahini so you know I’m all for this! Thanks for this recipe and the warning about the squash knife. My wife and I started eating a vegan diet 7 years ago. We use a lot of chickpeas since they are inexpensive and packed with nutrition. I’ve never eaten raw cranberries before. There’s no prep for them? No cooking or chopping? Nope, you can totally eat cranberries raw! Not a Feta cheese fan! What do you suggest as a replacement? This is a very attractive dish. It’s eye appeal caught my attention. Thanks! Goat cheese would be good! This looks delicious – can’t wait to try it! I’m not a fan of rosemary. What other herb(s) would you suggest with sage? Thyme or tarragon would be good – just pick your favorite wintery herb! Thank you! Also, is this meant to be served warm or cold? I like it warm best but either works! Can you give a sense of the minimum amounts of salt and pepper that could be used in the salad and dressing without compromising the flavor? Thanks! I was thinking of taking this to a potluck at work, do you think I could take it in a crock pot and put it on keep warm setting? Or would that be too much. I could keep certain ingredients out until right before its served. Thanks! I think that *should* work…I’d probably leave the pine nuts on top and not really mix them into the other ingredients so you retain some crunch. I just worry the crockpot may make stuff more soggy. Might also leave the dressing on the side? This can definitely be served room temperature too if you didn’t want to go through the whole effort of keeping it warm.